Sure, we are all making better food choices to stay healthy and fit. But, did you know that what you eat can also impact the health of your teeth? Being conscientious at any age will help to ensure you will be in the best shape your whole life. Here are the best snacks for healthy teeth. If you already are a cheese head, here’s yet another reason to love this food. It helps lower your risk of tooth decay. A study published by the American Academy of General Dentistry reported that when you eat cheese it raises the pH in your mouth. Additionally, it increases saliva production. Lastly, cheese contains calcium and protein, which help strengthen tooth enamel. Combined all of these factors help fight tooth decay. Similar to cheese yogurt contains calcium and protein. However, it also contains live cultures and probiotics. This good bacteria is beneficial because it fights the bad bacteria in your mouth. However, for maximum advantages, choose a variety that contains no added sugar. Did you know that almonds are also another great way to incorporate calcium and protein in your daily diet? They are a perfect source for those who are lactose intolerant or have an aversion to dairy. Almonds are also naturally low in sugar. One serving is about a quarter cup. Throw them in salads, stir fry, or just enjoy snacking on them alone. 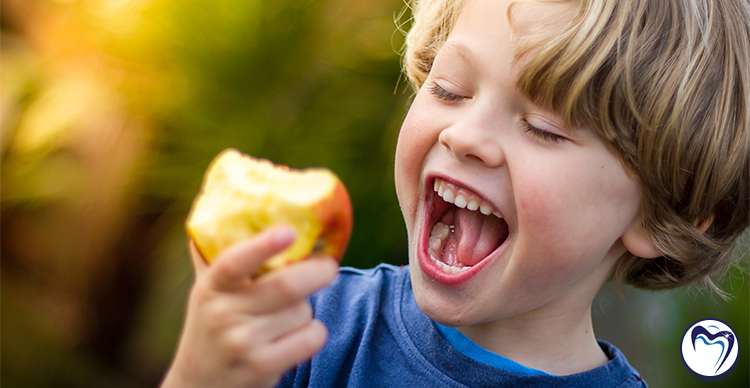 Apples are a great snack to help keep your teeth healthy. Eating apples produce saliva in your mouth, which helps wash away bacteria and food particles, the two main culprits for tooth decay. Naturally sweet, they also can satisfy a sweets craving. Plus, they are also high in fiber and water, serving to keep you fuller longer. Leafy greens are often referred to as “super foods” And, with good reason. They are packed with vitamins and minerals, such a calcium and B vitamins. Pump up the nutrients on your favorite foods like pizza and smoothies by adding Kale and Spinach. Carrots are not only crunchy and full of fiber, but they also help keep your mouth healthy. Like apples, eating carrots stimulates saliva production which will help rinse the mouth of bad bacteria. Therefore, reducing your risk for cavities. Celery is a bit like a natural toothbrush. The stringy, crunchy texture helps to scrub away food particles and bacteria. Celery is also a good source of vitamin A and C. These antioxidants also give your gums a healthy boost. Think celery is too bland? Add a little cream cheese for healthy and tangy flavor. The Denise Dental Studios believes in a comprehensive approach to improving oral health. We understand that eating healthy in combination with regular dental cleaning and exams ensures our patient’s well-being, at any age. Try a few of these best snacks for healthy teeth, and you will reap the benefits in so many ways! Contact the Denise Dental Studios to schedule an appointment today!